Regular church attendance by the faithful is not a simple habit, or a formal religious duty, or a social convention, or even a psychological way out of the stifling collar of the daily routine. On the contrary, going to church is for the believer an existential need (IE: Like breathing and eating). It is the need to live truly and authentically; to meet the Source of his Life, his Creator, and to be united with Him; to express his love and piety to the Mother of God and the Saints, the friends of God; to participate in the fellowship of his spiritual brethren. 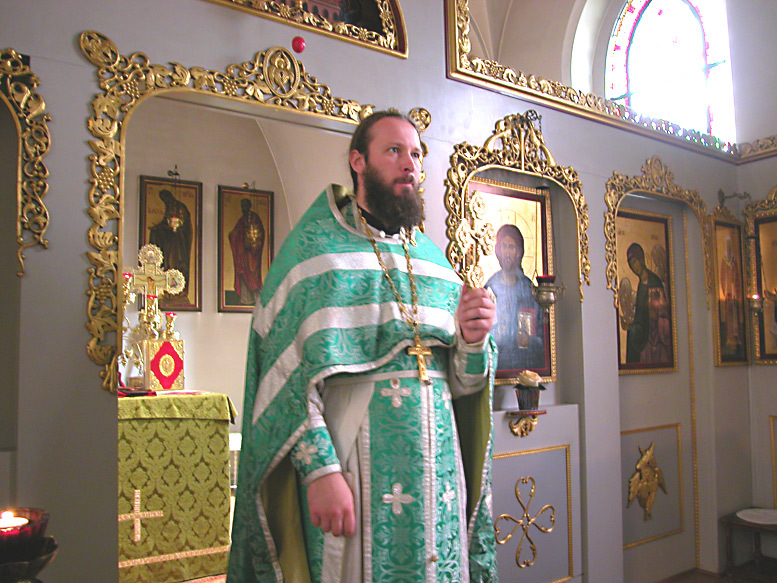 The Body and Blood of Christ, of which one partakes in the Divine Liturgy, grant the faithful Christian a fullness, which makes him feel that he is “a fellow-citizen with the saints and a member of the household of God.” So, when he departs from the church he has gained the power to confront the corruptibility of the daily life with the divine will and the perspective of eternal life. We pray, that the house of God, the parish church, becomes every believer’s house; that the Divine Liturgy is established as the center of our existence; and that the Table of the Holy Eucharist comes to be for everyone the place where his soul is nourished and vivified. The parish churches which God established in the cities and towns are like harbours in a great ocean, which offer indescribable peace of soul to those who take shelter in them from the turbulence of secularism. 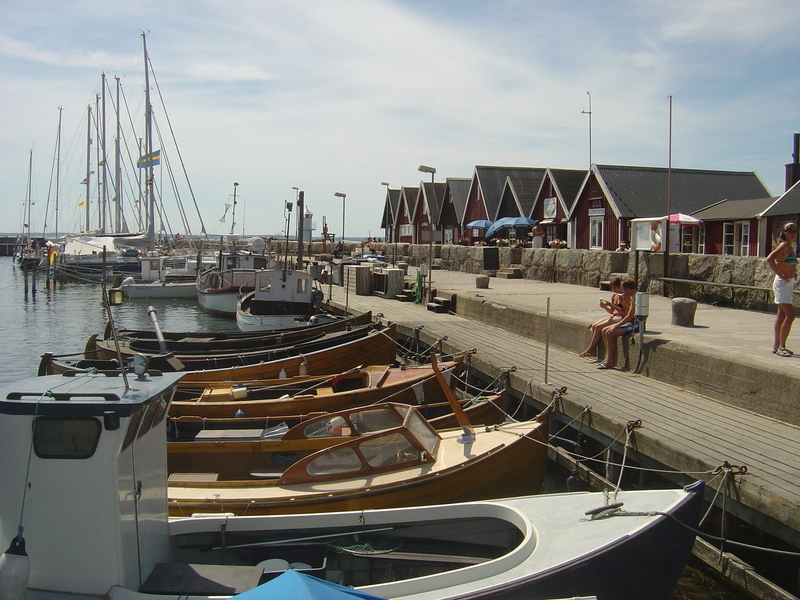 Just as a leeward and calm harbour offers security to the ships that are moored in it, so the church saves from the tempest of the cares of life those who take refuge in it and offers them illumination through hearing the word of God in peace and safety. The church is the foundation of virtue and the school of spiritual life. Stepping into just its threshold, on whatever occasion, one is delivered from the cares of daily life. Entering into it, his soul will be filled with a spiritual breath; with a quietness which induces awe and opens up the Christian life; it rejuvenates his morale by helping him to surpass the worries of the present; and it carries him from earth to heaven. If this is what one gains when there is no worship service, one can imagine what the blessing would be when the Liturgy is celebrated, during which the prophets teach, the Apostles preach the Gospel, Christ Himself appears among the believers, God the Father receives the sacrifice which is offered, the Holy Spirit supplies the exceeding rejoicing and church attendants overflow with blessings! In the Church, the joy of those who rejoice is preserved. In the Church, the embittered find cheerfulness, the sorrowful are comforted, and the heavy-laden are granted rest. This is because in the Church one finds Christ who says, “Come to me those who are tired and heavy laden with problems, and I will give you rest” ( Matth. 11:28). Is there anything more desirable than this voice? Is there anything sweeter than this invitation? It is to a Banquet that the Lord invites us, when he invites us to the church; when he urges us to receive rest from our labors ; when he transports us from a situation of pain to one of soothing and relief. This is because he unburdens us from the weight of our sins, and heals every distress and sorrow by granting us spiritual pleasure and joy. 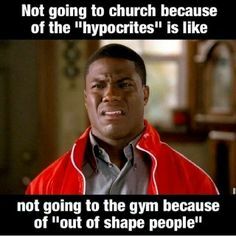 Why people do not go to church? In spite of all the above, only few people go to church. How sad! They all readily run to dances and entertainments. They all hear with pleasure the silly words of the singers. They enjoy for hours the shameful exchanges of the actors, without getting bored. But when God speaks, they yawn, they scratch themselves, they get headaches. Again, many run to the hippodromes for the horse races like maniacs; and although no cover is provided which would protect the viewers from the rain, they stay there even when the rain is torrential and the wind blows everything away. They do not count bad weather, nor cold, nor distance. Nothing keeps them in their homes. When, however, they have to go to church even the little rain becomes to them an obstacle for going. Then, if you ask them, who is Amos or Obadiah, or how many are the Prophets and how many the Apostles, they cannot open their mouth. For irrational things, popular singers and actors, however, they can provide every detail. What a situation! We celebrate the memories of Saints and relatively few come to the church. It appears that traveling some distance seduces the Christians towards neglectfulness, although it is neglectfulness alone that prevents them. The fact is that as nothing can prevent one who has a good disposition and zeal towards doing something from actually doing it, likewise one who is neglectful and indolent (lazy) all things can prevent him from taking any useful action. The martyrs shed their blood for the Truth and you debate travelling such a small distance? They sacrificed their lives for Christ, and you do not want to make a little effort? The Lord died for you, and you despise him? We celebrate the memories of the Saints, and you get bored from coming to church and prefer to stay at home! And yet, you must come, so that you can see the devil being defeated, the Saint becoming the winner, God being glorified and the Church emerging triumphant. “I am a sinner,” you say, “and I do not dare to look at the Saint.” But, it is exactly because you are a sinner that you need to go to church to become righteous. Or do you not know that those who stand and serve at the altar have also committed sins? This is why God tolerates even priests to suffer from some passions, so that they can understand human weakness and help others to repent and be forgiven. “Since, I did not observe what I was told in the church,” another one might say, “how can I come to church again?” Come to hear the word of God again, so that you may now try to put it into practice. When you put medicine on your wound and no result ensues on the same day, do you not put more medicine on it the next day? If a woodcutter, who tries to cut an oak tree, fails to do it at his first attempt, does he not try a second, and a fifth and a tenth time to do so? Should you not do the same? And yet, you might say, that you are prevented from going to church by poverty and the need to work. But neither is this excuse legitimate. The week has seven days. These seven days God distributed to us and to himself. He gave six days to us and left only one to himself. Is it on this unique one, then, that you refuse to stop working? But why did I say one whole day? I say it, so that you may do on this unique day what the widow of the Gospel did in the case of the merciful act. She gave two coins and received much grace from God. You too can lend two hours to God, by going to church, and you will bring back to your home benefits of innumerable days. If, however, you do not wish to do such a deed, think again, lest by this stance you may forfeit labours of many years. When God is treated with contempt, he knows how to disperse the moneys which are gained through work on Sundays. But even if you were to find an entire treasure-chest full of gold and for this reason you decided to absent yourself from the church, your harm would be so much greater as spiritual things are in comparison to material ones. Material things, even if they happen to be many and to run plentifully everywhere, cannot be taken to the other life, or be carried with us to heaven, or appear before that dreaded seat of the Lord. Indeed, many times they depart from us, even before we die. On the contrary, the spiritual treasure, which we acquire in the church, is an inalienable acquisition which follows us everywhere. “Yes, but,” says someone else, “I can also pray in my house.” Such a man deceives himself. Although it is true that one can pray at home, it is, nevertheless, impossible to pray there as one prays at the church, where there is a multitude of fathers and a unanimous cry of supplication is offered up to God (-communal worship/prayer, not isolated and individualised). God does not hear you as much when you pray alone, as he does when you implore him in union with your brothers. This is because there are in the church many more spiritual presuppositions than there are at home. 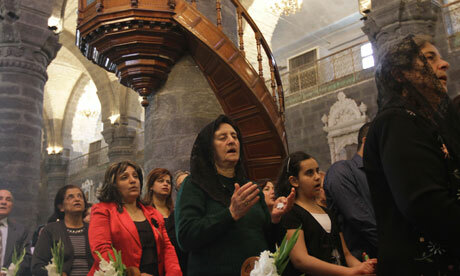 There is unanimity, the harmony of the believers, the bond of love, and the prayers of the priests. Indeed, this is why the priests preside over the church services – so that their more potent prayers may strengthen the weaker prayers of the people, and all of them may together rise up to the heavenly place. When we pray each of us separately on our own, we are impotent. On the contrary when we all gather together, then we all become more potent and attract to some greater degree God’s compassion. On a certain occasion, Peter the Apostle, was in chains in a prison. A fervent prayer was, then, offered by the believers who had gathered together, and he was immediately liberated. What, therefore, could be more powerful than the common prayer, which proved beneficial even to the pillars of the Church? I beg you, then, and I implore you, that you must not give preference to any other activity and care than going to church. Let us run eagerly to the church, wherever we may be found. Take care, however, that no one enters into this sacred space, having in mind this life’s concerns, or distractions, or fears. Rather, we must make our entrance to the church, after leaving all such things outside the gates of the church. The reason for this is that we come to the palace of heaven, and step on ground which shines with divine glory. Let us first remove from our heart any resentfulness and vindictiveness, so that we can escape condemnation, when we appear before God. And let us pray, saying: “Our Father… Forgive us our debts, as we forgive our debtors”. Otherwise, how can we expect Christ the Master to appear sweet and gentle towards us, when we are harsh towards our fellow human beings and refuse to forgive them? How can we raise our hands to heaven? How can we move our tongue with to pronounce the words of prayer? How can ask for forgiveness? Even if God wants to forgive our sins, we do not allow him to do so, by not forgiving our neighbor. Our vesture when we go to church should also be appropriate from every side. It should be seemly and not fanciful; because what is appropriate is also modest, whereas what is fanciful is rather unseemly. This is exactly what the Apostle Paul orders us to do, when he says: “I want the men to pray at every place, raising clean hands to heaven, without anger and hesitation resulting from little faith. Women who pray should also wear modest vesture, beautifying themselves with modesty and prudence, rather than ornate hairdressing and golden jewelry , or diamonds, or plushy clothing. They should be furnished with whatever befits women who say that they venerate God,” i.e. with good deeds (I Tim. 2:8-10). If, then, women are not allowed to display what indicates wealth, far more are they not allowed to wear what excites curiosity, such as make-up, eye- coloring , walking like a rocking horse, wearing strange clothing and so on. What can we say about women who come to church and decorate themselves with golden jewelry and affected hair-style? Have they come to a dance, or to take part in a wedding service? Golden jewelry and luxurious dressing are not needed here. They have come here to supplicate God for their sins. Why do they decorate themselves? The image they project is not of a woman who entreats. How can one groan, shed tears, pray with fervour , while being dressed in this way? Do you want to appear respectable? Put on Christ and not gold. Put on alms-giving, philanthropy, prudence, humility. These virtues have more value than gold. They make a beautiful woman more beautiful and an ugly one beautiful. Every woman should know that when she decorates herself too much, she becomes worse than her who is naked, because her artificial décor has covered up her natural comeliness. Our behaviour in church, when we get there, should also be the appropriate one, i.e. as it befits a person that stands before the presence of God. We should not engage in idle discussions, but stand with fear and awe, with attention and eagerness, looking down with our eyes and with our souls raised up to heaven. 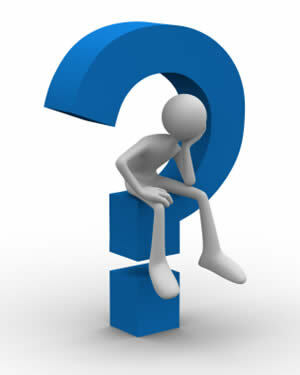 Many come to church, they repeat mechanically psalms and prayers and then they depart, without knowing what they said. Their lips move, but their ears do not hear. If you do not hear your prayer, than how do you expect God to hear it? I knelled, you say, but my mind was flying far away. My body was in church, but my soul was wondering outside. My mouth was saying the prayer, but my mind was calculating my monetary gains, my contracts, my business exchanges, my plots of land, my conversations with my friends. All these things occur, because the cunning devil knows that at the time of prayer we gain many benefits and this is why he attacks us with greater force. On other occasions we may lie flat in bed and think of nothing, but when we come to church to pray, the devil puts all sorts of things in our mind so that we may gain no benefits. 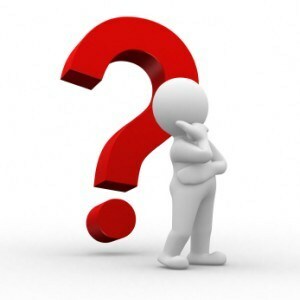 If, in truth, God asks of you to give a reason concerning your inattentiveness in church, or even your irreverence at the church services, what will you say? When he speaks, and you, instead of praying, are engaged in chattering with your neighbour about completely useless things? Even if God has forgiven us all other sins, this alone is enough to deprive us of our salvation. Do not think of it as a small transgression. To understand how grave it is, consider the commensurate case of human beings. Suppose that you are talking to an official person, or to a cordial friend. And while he speaks, you turn your head to the other side and start to speak with someone else. Will not your interlocutor be offended from your indecency? Will he not get angry? Will he not ask you to explain yourself? Alas! 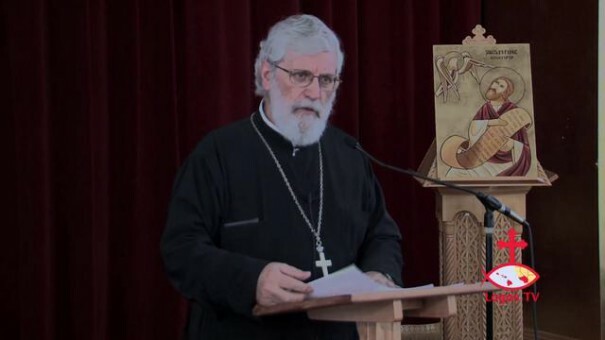 How can you be present in the Divine Liturgy, and while the Royal Table is made ready and the Lamb of God is sacrificed for your sake, while the priest is labouring for your salvation, you appear to be indifferent? At the time when the Cherubim cover their faces in awe and the heavenly powers along with the priest supplicate God for you, at the moment when the fire of the Holy Spirit descends from heaven and the Blood of Christ is poured from His immaculate side into the Holy Chalice, at this most solemn moment how could your conscience fail to reproach you for your recklessness? Think, my fellow-man, before Whose presence you stand at the hour of the awesome unfolding of the Mystery (Sacrament) and with whom -the Cherubim and Seraphim, with all the heavenly powers. Think of those who sing and pray with you. It is sufficient for your recovery to recall at this occasion that, while you have a material body, you are considered worthy to praise the Lord of creation together with the bodiless Angels. Do not participate, then, in this sacred hymnody with indifference. Do not allow your mind to turn to the cares of daily life. Remove from your mind every earthly thought and let it ascend to heaven, close to the throne of God. Fly there with the Seraphim, and open your wings with them and sing the thrice holy Hymn to the Holy Trinity. When the moment comes for the divine Communion and you are going to draw near the holy Table, approach with unwavering belief that you are in the Presence of Christ, the King of all. When you see the priest offering to you the body and blood of the Lord, do not think that the priest does this, but that the hand which stretches towards you is Christ’s hand; that He who brightened with His presence the Table of the Mystical Supper, He is now the One who beautifies the Table of the divine Communion. He is truly present there and examines each person’s disposition and clearly observes who approaches with reverence that befits the holy Mystery (Sacrament), and who comes with a wicked conscience, dirty and evil thoughts, and acts of contaminating sin. Consider, then, you too which vice you corrected, which virtue you acquired, which sin you wiped out through confession, in what way you made yourself a better person. If your conscience informs you that you did enough for the curing of your psychological traumas, i.e. 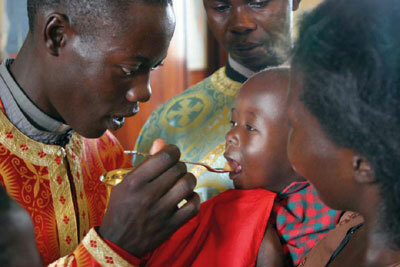 that you did a little more than mere fasting, then go ahead and partake of the sacrament with fear of God. Otherwise, stay away from the immaculate Mysteries (Sacraments). When you cleanse yourself from your sins, then you may draw near. You should approach, then, the divine Communion with fear and awe, with pure conscience, with fasting and prayer. Without making noise, or rushing, or pushing anyone else that comes along with you. Such behaviour is worse than despising the holy Mysteries. How often should one take Holy Communion? There is one more issue: Many take Communion once a year, others twice, and others more times. Of whom do we approve? Those who partake once, or those who do this many times or few times? We approve neither of those who do it once, nor of those who do it more times, but of those who approach the holy Chalice with pure heart and unimpeachable life. These may always partake of the Holy Communion. The others, who remain unrepentant sinners, let them stay away from the immaculate Mysteries; otherwise, they prepare for themselves judgment and condemnation. 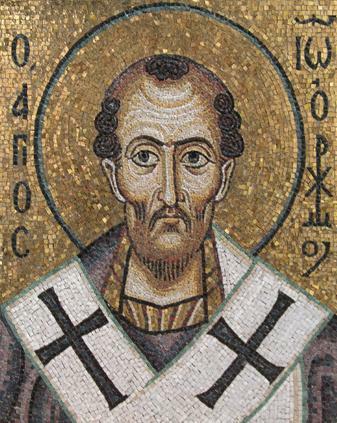 The Apostle Paul says: “Whoever eats the Bread and drinks the Cup of the Lord unworthily, sins against the Body and Blood of the Lord, bringing upon him his condemnation” (I Cor. 11:27, 29). He will be punished severely, like those who crucified Christ, since they too have sinned against His body. Many of the faithful have arrived at such a point of defiance of the holy Mysteries that, although they are full of innumerable vices and make no effort to amend themselves, they communicate on the Feasts without any preparation. Presumably, they do not know that the prerequisite of Holy Communion is not the Feast, but, as we said, the pure conscience. In fact, just as he who is not bothered by his conscience, should take Communion every day, so he who is laden with sins and does not repent, should not take Communion, even on a Feast day. 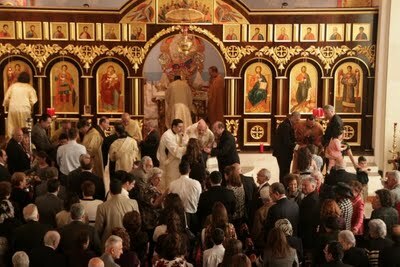 I implore you all, then, not to approach the divine Mysteries unprepared, or because there is a feast, but, if you ever decide to attend the Divine Liturgy and take Communion, you should cleanse yourselves, a number of days earlier, with repentance, prayer, works of mercy (alms-giving) and care for spiritual things. You came to church, then, and you were deemed worthy to meet Christ. Do not leave before the conclusion of the service. If you leave before the conclusion you resemble a run agate. When you go to the theater , you never depart before the conclusion of the show. You enter the church, the house of God, and you turn you back to the immaculate Mysteries? Fear at least him who said: “Whoever defies God, will be defied by Him” (Cf. Prov. 13:13). What do you do, o man? While Christ is present, and his Angels stand by Him, and your brothers still proceed to take Communion, and you turn your back and depart? Christ offers His holy flesh, and you cannot stay for a while, to thank him even with a few words? When you are invited to dinner, you do not dare to leave, even if you have filled yourself, when your friends are still sitting around the table. And now when the awesome Mysteries of Christ are distributed, you leave everything in the middle and depart? Do you want me to tell you whose work they imitate those who depart before the end of the Divine Liturgy and do not partake in the last thanksgiving prayers? It is perhaps too bold what I am about to say, but I will say it. When Judas participated in the Mystical Supper of Christ, and while all were reclined around the table, he stood up before the others and left. It is this Judas, then, that they imitate… If he had not departed on that occasion, he might not have become the traitor, and might not have been lost. If he had not separated himself from the flock, he would not have been found alone by the wolf, who devoured him. What should one do after going to church? We should depart from the Divine Liturgy like lions which breathe out fire, and are terrifying even to the devil. This is because the holy Blood of the Lord which we communicate imbues our soul with a tremendous power. When we communicate worthily, we drive away all the demons and bring near us the Angels and the Lord of the Angels. This Blood is the salvation of our souls, because by this Blood the soul is washed and adorned. This Blood makes our mind brighter than fire and our soul brighter than gold. Bring your brothers, then, to the church, admonish those who have run astray, advise them not just with words, but with deeds. Even if you say nothing, but depart from the holy Liturgy, showing to those that are absent -with your appearance, your way of looking, your voice and your manner of walking -what benefit you gained from the church, this is enough as an admonition and advise. This is how we should depart from the church, as coming out of the supreme sanctuary, as if we came down from heaven. Teach those who do not come to church that you sang with the Seraphim, that you belong to a heavenly citizenship, that you met with Christ and spoke with Him. 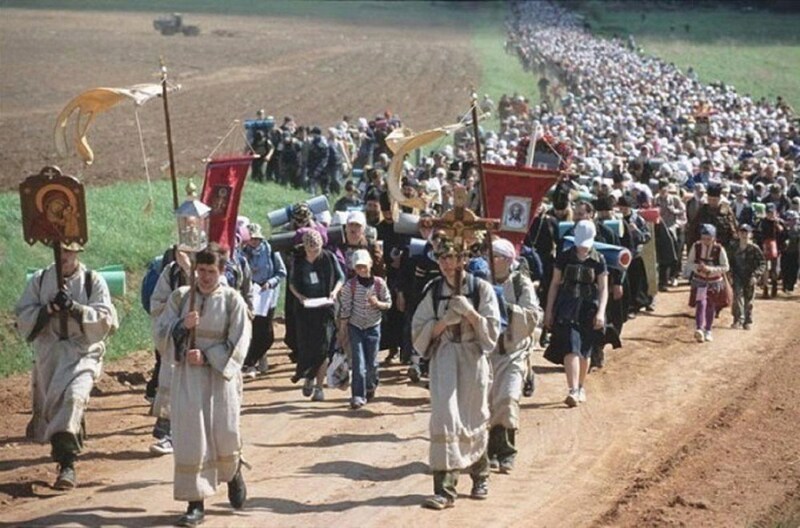 If this is the way we experience the Divine Liturgy, we will not need to say anything to those who were absent. They will see our gain, they will feel their own loss and they will run quickly to the church, in order to gain the same goods, by the grace and love for humanity of our Lord Jesus Christ, to whom, together with the Father and the Holy Spirit belong the glory in all eternally.